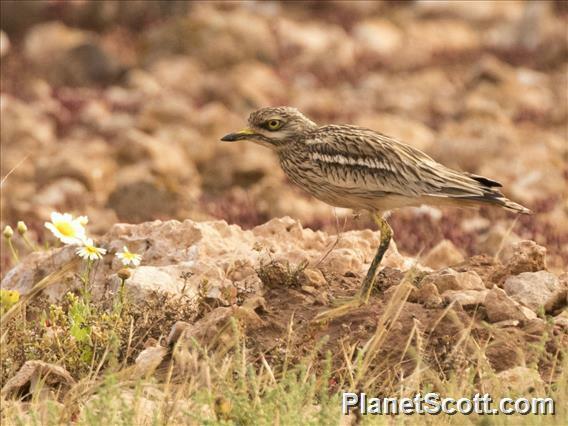 Stone curlews hunt at night. Their diet consists of invertebrates such as beetles, woodlice and earthworms, as well as the occasional small mammal or bird, all of which are taken from the soil surface (3). They return to England from the over-wintering grounds in March, and pairs, which may be life-long, return to traditional nesting sites. The nest is a scrape on the ground in which two eggs are laid (2). Eggs and juveniles are cryptically coloured to provide camouflage against the stony substrate. The chicks improve this camouflage by their habit of freezing flattened against the ground when disturbed or threatened (2). If chicks or eggs are lost the pair may produce a second brood (2).